But qualified, certified, professional technicians available 24/7. As the Office Coordinator, Janet Nero is the first person you will meet at TeamLogicIT. She is also the voice you’ll hear from on those important follow‐up calls. Janet is from the area and has been employed in the local market for more than 13 years, where she has maintained a great deal of common sense and patience. 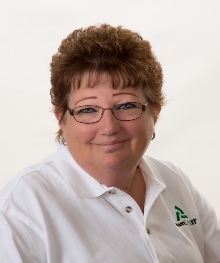 PRIOR EXPERIENCE: Janet held positions in Retail Management at two national retail chains (19 years), Sales at a local engine company (3 years), and Front‐Office Receptionist at a local telecommunications company (3 years). She is a “Jackie” of all trades and her extensive knowledge shows in her ability to solve problems quickly and efficiently. Calm professionalism and the willingness to assist every customer with respect is Janet’s key to success. OUTSIDE INTERESTS: In her free time, Janet loves spending time with her family – especially her grandchildren. EDUCATION: Janet is a graduate of Carencro High School. She hopes to work at TeamLogic IT until retirement.